Yes, seventeen. What is this number you ask? Seventeen is the number of people that will be in our house from Christmas day to January 2nd. That would be 8 days, 17 people, 4 bedrooms, 3 bathrooms, and one kitchen table that seats 8. It being the holiday’s and the fact that we live in vacation town we have visitors pretty often. Although, most of the time they seem to be random friends (mostly looking to snowboard and free place to stay) my brothers invite in. These extra eight however, are most definitely not random. Remember Mrs. Mooney? She makes that amazing Penne, among other things. Well the Mooney’s are headed out of dreary old Cleveland and headed to the snow covered mountains for a real Clark Griswold Christmas vacation! Let’s just hope we all come out of this in one piece. Seriously though now that I think about it we are the Griswold’s. We have a seriously crazy group of people – brothers will be piling in with brothers, kids that are far too old to be sleeping on their parents floor will be, guests will be crammed onto mattresses in every little nook and cranny, we even have a space under the stairs that we call “the Harry Potter closet”. We have an enormously oversized tree (in our kitchen), lights have been strung on as many trees as possible outside, Christmas music is playing just about 18/7, and drinks will most likely be flowing (although we do not do eggnog, I do not even know if I have ever tried it. Something about drinking eggs just does not sit well with me) on a fairly consistent basis. So, like many of you this holiday season I have been on the lookout for foods that feed a hungry pack and will please everyone. 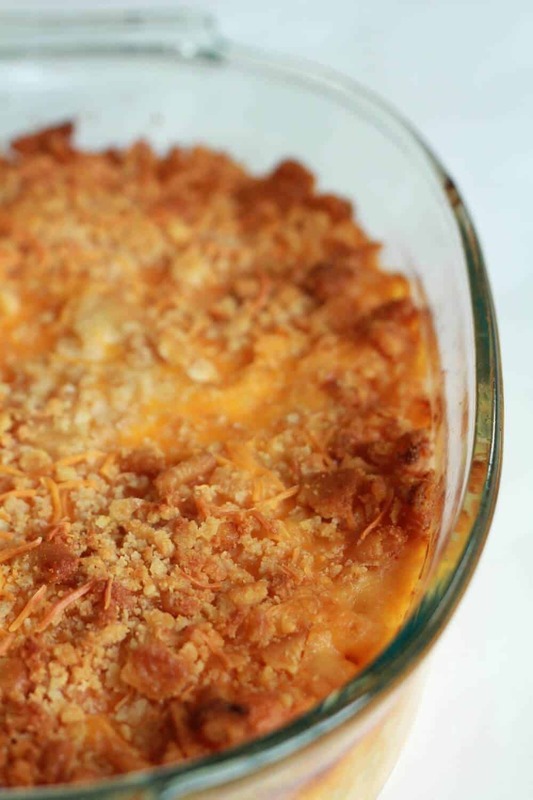 Lucky for you I have this amazingly creamy and flavorful backed mac and cheese recipe for you! It is perfect because it is not just boring old cheddar cheese. 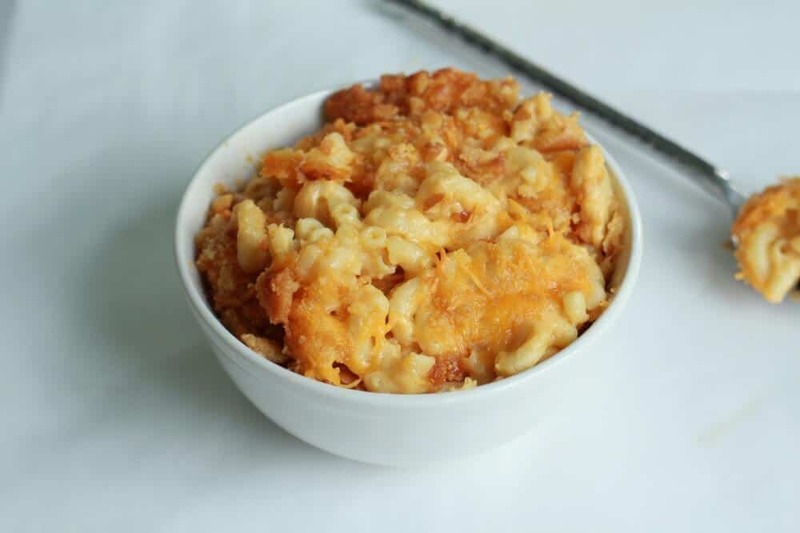 This mac and cheese actually has some flavor due to a whole lot of Havarti cheese and just a kick of heat. Another bonus It can be fully prepared ahead of time. All you have to do is throw it in the oven an hour before dinner. If you have a really big group you might just want to double the recipe. Trust me people will be begging for more. 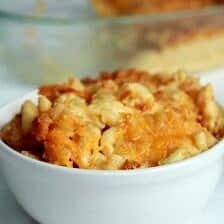 The picky eaters, the I’ll eat anything eaters and the eaters with real taste buds all went crazy over this mac and cheese! 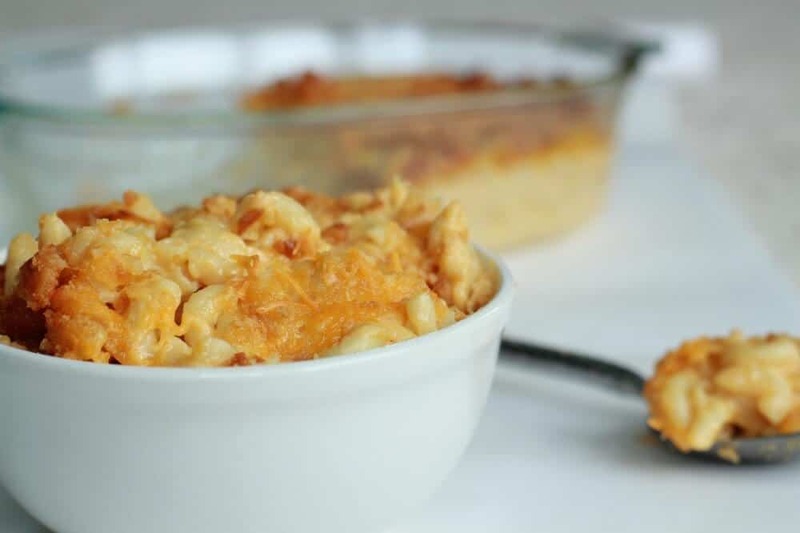 This mac and cheese actually has some flavor due to a whole lot of Havarti cheese and just a kick of heat. Another bonus It can be fully prepared ahead of time. All you have to do is throw it in the oven an hour before dinner. Preheat the oven to 375 degrees F. Bring a large pot of salted water to a boil. Add the pasta and cook until just slightly softened, about 6 minutes. Reserve 1/2 cup cooking water, then drain the pasta and rinse under cold water. Meanwhile, melt 4 tablespoons butter in a large saucepan over medium heat. Whisk in the flour, mustard powder, Worcestershire sauce, hot sauce and cayenne and cook, whisking, until the mixture is smooth and slightly golden, about 2 minutes. Whisk in the milk and cook, whisking occasionally, until the sauce begins to boil and thicken, about 5 minutes. Stir in the all but 1 cup of the harvarti cheese and cheddar cheese; cook, stirring, until the cheese just melts, about 1 more minute. Stir in the pasta, adding the reserved pasta water as needed to make a creamy sauce. Season with salt. Brush a 9-by-13-inch baking dish with melted butter. Spread the pasta mixture in the dish. Melt the remaining 4 tablespoons butter in a bowl in the microwave; stir in the crushed crackers and parmesan. Sprinkle the reserved havarti and cheddar cheese evenly over the pasta, then scatter the cracker mixture on top. Cover with aluminum foil and bake until heated through, about 25 minutes. Remove the foil; continue baking until browned and bubbly, about 20 more minutes. Let rest 10 minutes before serving. slightly adapted from food network. I do not think there could be a family more like the Griswold’s. 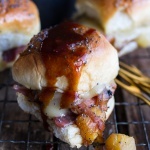 Ham and Cheese Sandwiches w/Bacon, Pineapple Caramelized Onions + Jerk BBQ Sauce. 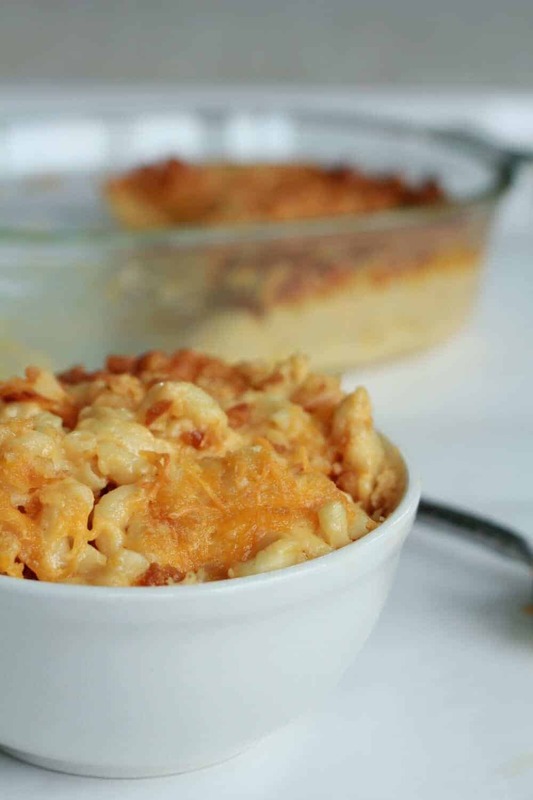 We love mac and cheese and eat it regularly. This version looks amazing and your photos make it look awesome! 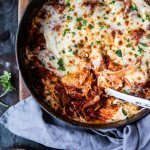 Could you please share the recipe or is it here and I am completely overlooking it. I would LOVE to prepare this for a side a Christmas. Thanks!! I am so sorry! The recipe plugin I us has been having some hiccups! It is now visible! Let me know what you think! It is the perfect side for Christmas! This reminds me of the mac & cheese I loved as a kid! 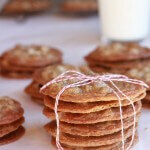 Thanks for sharing on Foodie Friends Friday and we love it if you would link back your recipes to us. Holy hannah! Seventeen guests is A LOT. 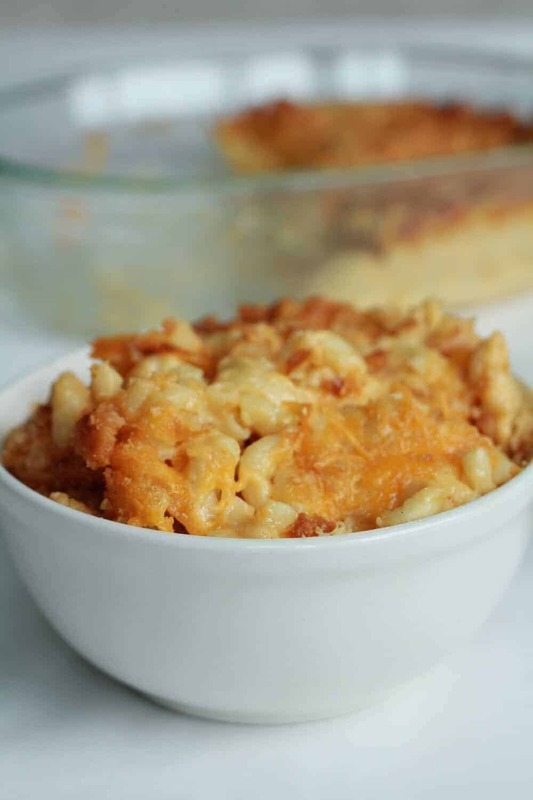 This mac and cheese will keep them all happy, I am sure 🙂 It looks so great (we love baked mac and cheese). Pinning! Um, make that 21. Four more people are now flying in for Christmas! Yikes! OMGeee this looks amazing! I’ve been looking to make some homemade Mac and Cheese. Can’t wait to try this recipe. Thanks so much for linking up to Creative Thursday. Can’t wait to see what you share next week! Have a wonderful weekend. Love ritz on anything. They provide a great crunch. The Havarti is a great choice too. Thanks for sharing on Thursdays Treasures. The cheese combination of havarti, cheddar and parmesan sounds quite good! Wow, 17 people!! You’re so nice to host them all! That mac and cheese looks amazing. Great choice for feeding a crowd! I have been on the look out for a good homemade Mac & Cheese. I can’t wait to give this a try. Thanks for sharing! Have a wonderful day! This recipe is fabulous. Made it for 7 adults for a lunch time meal. Many had 2 and even 3 helpings … the highest compliment a cook can receive. This is a keeper. I made the recipe exactly as listed. Wasn’t too sure about using Ritz crackers instead of bread crumbs for the topping, but it was perfect. 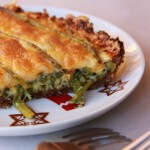 So happy to have found this recipe as I will be making it again and again when I have a bunch to feed. Be forewarned though, you probably will have very few leftovers! Thanks so much. presentation subject matter, which i am going to convey in university.